One sees the leverage of the group being applied to the individual by way of public confessions, the demand for candor, the infinite patience and inscrutability of authority. There appears the “carrot and stick” technique along with the utilization of role disruption and social anxiety as motivating forces. Beyond that, one is reminded how systematically and thoroughly the integrity of psychological privacy is undermined. Professor Gordon is correct regarding the Provo Experiment and the Communists: there are parallels between the two programs. However, a recognition of this fact does not permit any simple conclusion as to what should be done. First, they point out that there are also parallels between these techniques and accepted practices in religion, politics, medicine and psychology. They claim that there are forms of “brainwashing” in all of the above – in any the attempt “to change perceptions, attitudes and behavior through emotional stress, confessions, the presentation of new alternatives, followed sometimes by analyses.” They point out that other methods of juvenile reform are largely ineffective and they claim that the problem with the Communists’ use of these methods is that the victims did not understand the objectives of their captors and didn’t understand the means by which the objectives would be realized. Thus, it is one thing to break a person down under intolerable stress and quite another to use this stress positively, not only to modify perceptions, but to permit a greater susceptibility for the examination of new alternatives, skills, and opportunities. The Provo Experiment was based on an earlier study that used similar small-group methods which probably predate the term,“brainwashing.” The New Jersey Experimental Project for the Treatment of Youthful Offenders at Highfields formally launched in 1950 and utilized small-group methods developed by Dr. F. Lovell Bixby and Lloyd W. McCorkle that would become controversial when used at Provo. The “Highfields Experiment” in New Jersey was based on an even earlier study in “Guided Group Interaction” methods that were initiated and developed in the 1940s at the Fort Knox Rehabilitation Center by Dr. Alexander Wolf. During World War II, a “comprehensive group therapy program that embraced all aspects of living” was developed there for the reform of recalcitrant American soldiers (McKorkle, Elias, Bixby, 1958, p 73). The ethical questions about “brainwashing” in treatment settings, first posed more than fifty years ago, are still relevant and still controversial today. But the discussion has changed as cultural values have shifted. Trauma-informed critics today tend to focus on iatrogenic effects rather than the violation of “American” values, and proponents spoke more candidly (and eloquently) about the therapeutic use of “brainwashing” methods during early 1960s than they have since the late 1960s, when programs using these methods started to appear all over the United States. In his book Coercive Persuasion (1961), Edgar Schein is specific about the treatment of American youth and proposed that we consider the therapeutic potential in “brainwashing” by turning the perspective around – we aren’t imitating totalitarian thought reform programs, they’re imitating us. “It could just as well be argued that the Communists are using some of our own best methods of influence,” he said (p.269). Lewis Yablonsky, in his book, Synanon (1965), reports that Charles Dederich and other directors at Synanon specifically claimed to use methods of brainwashing “to wash out things in the brain that had caused trouble” and to “start fresh with new ideas, attitudes and values” (p. 102). Straight’s executives were not so fearless and forthright as Empey, Rabow, Schein or Dederich; by the early 1980s, the American public associated “brainwashing” with cults and violence. The “B” word was a scary reminder of Charles Manson, Patty Hearst, Jim Jones and the People’s Temple massacre in Guyana. 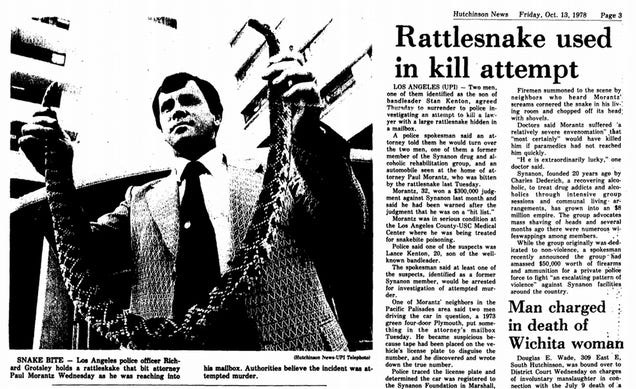 In late 1978, Charles Dederich ordered the murder of one of Synanon’s adversaries, Paul Morantz, leading to the famous picture of the giant rattlesnake his members had placed in Morantz’s mailbox, rattle removed. Morantz was bitten by the snake and hospitalized, but fortunately survived the attack. This sensational story was the focus of a media frenzy until 1980, when Dederich plead “no contest” to the charge of conspiracy to commit murder. In the early 1960s, experts argued that “brainwashing” could be used for good or “evil” purposes, but by the time Straight was poised to become a national franchise, these associations were a threat. Straight’s national expansion depended on steady recruitments and good PR; their business model was threatened by a growing reputation for “brainwashing.” By the time Dr. DuPont had spoken to the Malcolms in 1981, Straight’s controversy was well known in Florida but had only begun to grow across state lines. The Atlanta facility, the first outside Florida, had opened just 5 days before the Malcolms arrived in St. Petersburg; the Cincinnati facility opened a few months later, in January, 1982. Complaints of coercion and brainwashing by Straight Inc., a three-month-old drug rehabilitation program in Clermont County, might prompt a state investigation. The Cincinnati chapter of the American Civil Liberties Union, which is investigating the complaints, has not taken legal action so far. But Jonathon Schiff, a ACLU co-operating attorney, related the complaints in a letter in mid-March to the Ohio Bureau of Drug Abuse and asked for an investigation of the program, which treats people aged 12 to 21. Does Straight brainwash kids? Is it a cult? Does it have a religious overtone? Are teens’ constitutional rights violated? In a 31-page report, the Malcolm’s cleared Straight of all these charges but recommended several areas for improvement and safeguards. They labeled Straight a “phenomenal” program that accomplishes what it intends. While state authorities investigated the Cincinnati program, Ronald Reagan’s Drug Policy Advisor, Carlton Turner, attended one of Straight’s fundraising banquets in Florida, publicly praising the franchise to all in attendance, including the Florida State Attorney General, Jim Smith, and several state representatives. Check back next week for Part 4. Chatfield’s series will run every Thursday.